VpCI-326 is a corrosion inhibitor oil additive for hydraulic oil and gearbox assemblies. VpCI-326 performs effectively under the adverse conditions of 100% relative humidity, and in the presence of such corrosive species as chlorides, sulfur compounds, or hydrogen sulfide. 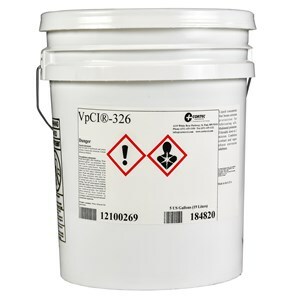 VpCI-326 contains no hazardous chromates, nitrites, or phosphate inhibitors. VpCI-326 utilizes the finest paraffinic petroleum distillates as carriers. VpCI-326 possesses an exceedingly high flash point, enhancing in-plant safety when compared to common oil protectants. VpCI-326 is supplied in concentrate form, which is easily diluted with lubricating, hydraulic, or preservative oils; saving shipping and inventory expense. VpCI-326 is a broad range corrosion inhibitor not only effective on ferrous metals, but also effective on zinc, aluminum, galvanized steel, copper, cadmium, silver, brass, and many other alloys. Fog interiors with VpCI-326 concentrate at 1 liter/m3 (1 oz/ft3) of enclosed space. VpCI-326 is not recommended for applications involving direct contact with water. Contact Cortec for application questions. Available in 5 gallon pails (Cortec Product # 12100269) or 55 gallon metal drums (Cortec Product # 12100270). 5 gallon drum weighs 50 pounds and ships under our standard shipping rates. The 55 gallon drum must be shipped by truck. We will provide you with a freight quote before we ship this product.